It’s that time of year. Soon action sports athletes from around the world will flock to Aspen, Colorado for the 2013 Winter X-Games, held January 24-27. 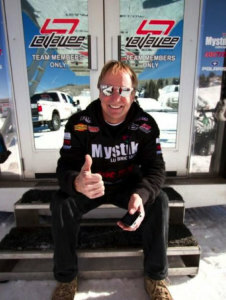 Glenn Kafka, founder of Kafka Granite, will also be headed to Aspen as co-owner and crew chief of Team LaVallee. Team LaVallee will have an exciting schedule, as they are the only team to be competing in all four snowmobile disciplines. Last year, Snocross had been omitted from the Winter X-Games schedule for the first time in 14 years, along with one of the newer snowmobile events called Speed and Style. This year, by popular demand, all four disciplines are back, allowing the opportunity for all of Team LaVallee’s athletes to compete. Levi LaVallee, who has just been named the 19th most influential person in action sports by ESPN, will be the only snowmobile athlete competing in all four events: Snocross, Speed and Style, Freestyle, and Best Trick. LaVallee has four X-Games gold medals, is the first to attempt a double backflip on a snowmobile, and holds the world record distance jump at 412 feet. Kyle Pallin, Team LaVallee’s newest racer, will be competing in Snocross for his second time at Winter X. Pallin placed 4th in his first Winter X-Games appearance. Jake Scott, the team’s youngest rider, will be serving as the first alternate for Polaris in the Snocross event. Help us cheer on Team LaVallee! Check out the ESPN TV Listing to watch from home, and follow Team LaVallee on Facebook or Twitter to stay up-to-date on all the action! Kafka Granite sponsors Team LaVallee, along with Mystik Lubricants, Loctite, Polaris, Parts Unlimited, Arctiva, Fox Shox, Earth, Inc., Woody’s, Kafka Conveyors, and Stratford Sign Company. While Kafka Granite’s range of pathway products have proven successful for a variety of applications such as walkways, bike paths, driveways, and nature trails, Kafka Granite is now driving these same products to golf courses. 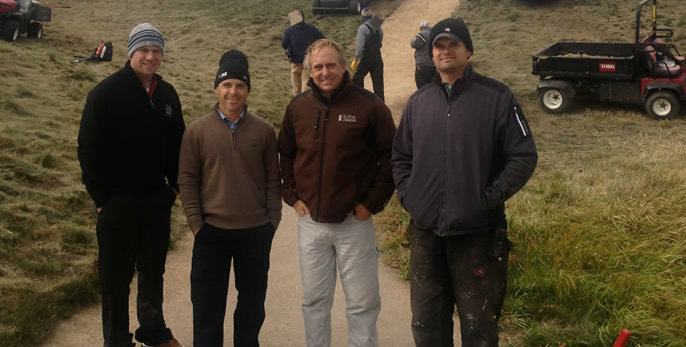 When prestigious golf courses such as Whistling Straits in Kohler, WI, Erin Hills in Hartford, WI, and Hazeltine in Chaska, MN, were looking for a less obtrusive cart path to help maintain a natural look and feel on their course, they all turned to Kafka Granite. Kafka Granite’s pathways are an aesthetically pleasing and environmentally friendly alternative to hardscape. Kafka Granite offers two different materials recommended for golf course cart paths, which are both available in over 40 different colors. Kafka Granite’s Stabilized Pathways blend an organic binder with decomposed granite, reducing mud, dust, and erosion while retaining a firm surface. Stabilized pathways are also permeable, allowing storm water to quickly drain back into the earth. Although stabilized pathways are much lower in erosion than a standard decomposed granite path, we do not recommend using stabilized pathway on slopes over 8%. However, Kafka Granite’s StaLok Pathways are much more resilient and can be applied on even steepest of slopes. StaLok Paving Material combines decomposed granite with engineered polymers to create a non-permeable, but aesthetically pleasing, durable, and dustless pathway. As an added bonus, StaLok cart paths absorb the impact of stray golf balls, allowing golfers to more easily recover from errant shots. With over 40 different colors of pathway aggregates and recycled materials, it is easy to match your current landscape or create natural and sustainable cart paths that are unique to your course. With spring just around the corner, now is the perfect time to start thinking about renovations for your favorite golf course. Contact one of our knowledgeable sales representatives today for more information, samples, and pricing!